Water is the natural drink essential for life. Drinking water is a healthy habit and toy should use this natural elixir for good health in general. Most of the people drink water only when they are thirsty, you should know that drink water should be done more frequently not only when we have the need of. But there are situations when drinking water is not recommendable. For example you should not drink water before and after meals because you can have detrimental effects on your health. If you drink water before meals you are slowing down the digestion. By adding some water in your system you are diluting the gastric juice and weakling the digestive system. If you have need to take medication before meal, do this at least one hour before the meal. When we drink water right after the meal we make influence on the food quality and the strength of the digestive system. Drinking water after meal for sure will give you extra pounds at the end. Probably at least one hour will be the great time for drinking water after meal. In this period your food will have time to digest, you will feel satiety and you will satisfy the need for thirst. When the digestion process will be over that’s about couple hours after a meal you can drink water as much as you can. 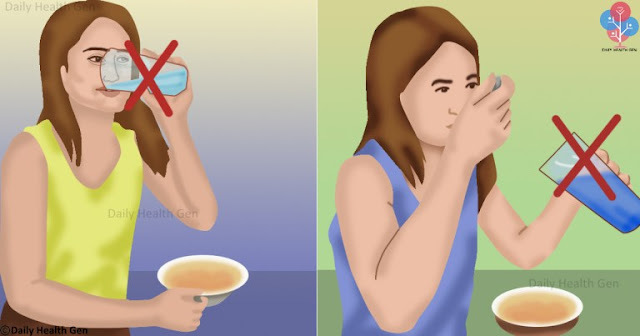 If you having problems with your thirst and you cannot control, so you need to drink water between meals, do this in small amounts. In order to prevent your body of gathering toxic waste drink your water in room temperature. Cold water makes the enzymes inactive which leads to toxic waste in the body. Also you should avoid drinking carbonated and caffeinated drinks during your meals in order to avoid acid reflux and digestive problems.